One of the pleasures of eating in China is the culinary calendar. Special foods are eaten on certain occasions. In general, festival-day foods are small sweets, which are economical, easy to give and receive, and can be made distinctive to the occasion (and also to the town, and even imprinted with the name of the bakery). The fact that sweets play such a minor part in Chinese cuisine overall makes it even more sensible for sweet treats to dominate the festive-day special foods. The most popular and widely known of these is the moon cake, consumed during the Mid-Autumn Festival, a full-moon celebration that occurs on the 15th day of the 8th lunar month. The moon cake that is best known all over the world, with is brown glossy crust and its filling of pureed bean or lotus seed paste (often studded with salted duck egg yolks) is the Cantonese style moon cake, but there are many variations. Suzhou-style moon cakes, a version going back 1,000 years, have flaky dough and exceptionally sweet fillings. In Yunnan, one of the local mooncakes has a buckwheat dough casing. In Chaoshan, a flaky dough is favored, but so is the lard that is present in all mooncakes, for there, the lard aroma is retained in the final pastry. Taiwanese moon cakes lean toward mung bean paste fillings, and they often put mochi in the center—one of several Japanese-favored foods that were adopted and retained in Taiwan after the occupation of the Second World War (another is mayonnaise). These are a few of the many types of traditional moon cakes. Contemporary moon cakes, meanwhile, have gone wild. To have some fun, and drive up sales, chefs first toyed with the fillings, adding taro, pineapple, and durian. It was a short step from there, to yam, chicken floss, ham, chocolate, and coffee. Then bakeries started changing the heavy, lardy nature of the moon cake, producing versions made of jelly, of yogurt, and the “snow skin moon cake”, which must be kept frozen and resembles a mochi ice cream ball. 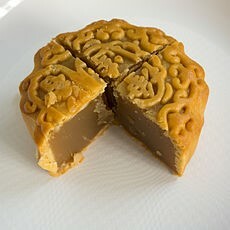 Moon cakes today are consumed throughout Asia, and are different everywhere. Malaysia, Vietnam, Indonesia, Japan, Singapore, The Phillippines, and Thailand all have distinctive local moon cakes, with significant variations in style and filling. Stories and legends are often told in connection with moon cakes, but there is general agreement that the holiday and the cake have their ultimate roots in Chang E, China’s moon goddess, who is associated with immortality. China’s ancient Book of Rites (禮記) specifies sacrifices to be made by the emperor, including to the moon, in autumn. The full moon of the eighth lunar month was not codified as the Mid-Autumn Festival, however, until the Song Dynasty (960-1279). Although the holiday was part of the calendar before the Yuan (Mongol) Dynasty (1279-1368) even began, a legend has long clung to the cakes which concerns the overthrow of the Yuan (Mongol) Dynasty by the subsequent Ming (Han Chinese) Dynasty in 1368. Supposedly the peasant uprising that led to the overthrow of the Yuan and the launch of the Ming (a glorified era) was facilitated by messages smuggled via innocent moon cakes. Some versions of the story involve slips of paper with instructions for the revolt concealed in the filling. Other, even more charming, versions claim that the secret messages were encoded in multiple characters imprinted on top of the cakes as they were placed in gift boxes, in scrambled positions. The message would not have been coherent, or would have cleverly seemed to mean something else, until the cakes were repositioned in a different order. Whether there is any truth to this may never be known, but the moon cake industry today is almost entirely organized around gift boxes—lavishly decorated, each cake inside safe in its own nest, sealed in its own plastic wrapper. The gleaming red boxes are piled up near the entrance of every Asian grocery in September and October. They are labeled so you can choose the fillings you like (lotus seed, red bean, nuts and seeds, the list goes on) and those you don’t (salted egg yolk?). But these are gift boxes, and therein lies the modern irony of the moon cake. While many boxes are consumed with relish, many others are gifted, re-gifted, and gifted again, all the way to their expiry date, as social graces are expressed and received with great warmth and sincerity, around a delicious but heavy pastry not everybody wants to eat.